THE UNIVERSITY OF AMERICA Epluribus Universitatibus, Una ! APPLY FOR $1500 CHURCH.ORG SCHOLASHIP HERE BEFORE DECEMBER 1 DEADLINE . 1. UA DIVINITY SCHOOL STUDENT APPLICATION AND REGISTRATION FORMS click to download. Every applicant must be a high school graduate and hold a high school diploma, GED,WAEC,NABITEB or other international equivalents to be admitted into The U.A or ‘‘A- LEVEL'' certificate from a recognised college. Or a relevant DIPLOMA, ASSOCIATE, BACHELORS, MASTERS DEGREE from an approved college or university . Any students, who does not meet the above requirements but demonstrates strong academic potential and excellent communication skills, may be considered on a case by case basis.
. Such students will only be admitted under academic probation ,first as certificate students in respective programs. If they maintain a score of at least 2.5. GPA till the end of their certificate exams, they may then be allowed to enrol into the Diploma programs. And a GPA of 2.5 must be maintained at the end of the Diploma exam for the student to be finally allowed into a bachelor`s degree program. The students in this category must also meet every other requirements required by the admission department and the faculty of the university before they are satisfactorily enrolled in a BA program. after the student’s application is received by the university, an official registration for the classes is required from all the students. every student must register at least 15 semester credits every semester. no student will be accepted into classes without completing application and registration procedures. Advance placement and credits transfers not more than ten years old are accepted from students on a case by case basis . Advance placement and transfer of already earned credits are accepted only from accredited colleges . In the UA the students performance at the conduct of examination is taken very serious, every student of the university must take all the required exams during the course of their studies in order to receive awards for credits or to be eligible for graduation. correspondence students are required to take a proctored examinations at any UA approved centers worldwide and these exams must be conducted in such manner and methods approved by the university or the examination and the result will be obliterated. any student reaching the culmination of their studies must apply to the university registrar requesting to graduate. the students intending to graduate must attend all requisite lectures and labs and must have taken and passed all the required examinations, pay to date , all the UA 's outstanding debts owed and have maintained a record of good character before he or she be approved for graduation . repeated tardiness , absenteeism, loitering and poor academic performance . Violation of the university's non-discrimination policies. In violation of the university's sexual harassment policies and philosophy. if found in constant disrespecting any of the university's personnel or faculty members ,fighting in the lecture hall ,classroom, library, lab or in any of the university's environment or within the school hours when the student supposed to be in the school . disrupting the class during lectures or participating in the activities such as exam malpractice, assault, any riots, notorious violent gangs and secret cults membership and, committing any crimes against the society within or outside of the school, dangerous body tattoos, indecent body exposure, un acceptable long dreadlocks hair- do, men wearing hair breads, men wearing earrings in any of their ears or any acts that threatens the life others in the campus. Any student caught in any of these destard acts in the school campus shall be expelled without notice and refund. Every student admitted fully into the UA's programs and wishes to withdraw or drop from being a student of UA is given the period of 72 hours to resign the enrolment/registration contract in order to receive a full refund of all fees and tuition excluding the application and admission fees. If the student is already receiving instructions and withdraws prior to the completion of the 75 % of the scheduled program the university will refund to the students the sum of which is the exact pro-rated portion unexpended by the student. The prorated amount (in the case of a correspondence program) shall be determined by the ratio of lessons materials mailed to the student. Only the refund request made by student in writing shall be honoured by the university. The student has up to 90 days from the first day of absence or withdrawal to request for the refund. Any request for refund made after 90 days will not be honoured. Only students expecting refunds are advised that the refunds usually take 30 to 90 days to process. if you did not get your refund after 90 days of written request and receiving approval response from the university about such refund, please contact the university registrar at ;- 951-239-3084. How long does it take to complete a degree at UA? This includes taught courses, oral examinations, multiple choice examinations, a 15,000 – 30,000 word Dissertation and oral assessment as well as practical elements and periodic research papers. This includes taught courses, oral examinations, multiple choice examinations, a 50,000 – 70,000 word Thesis and oral assessment as well as practical elements and periodic research papers. 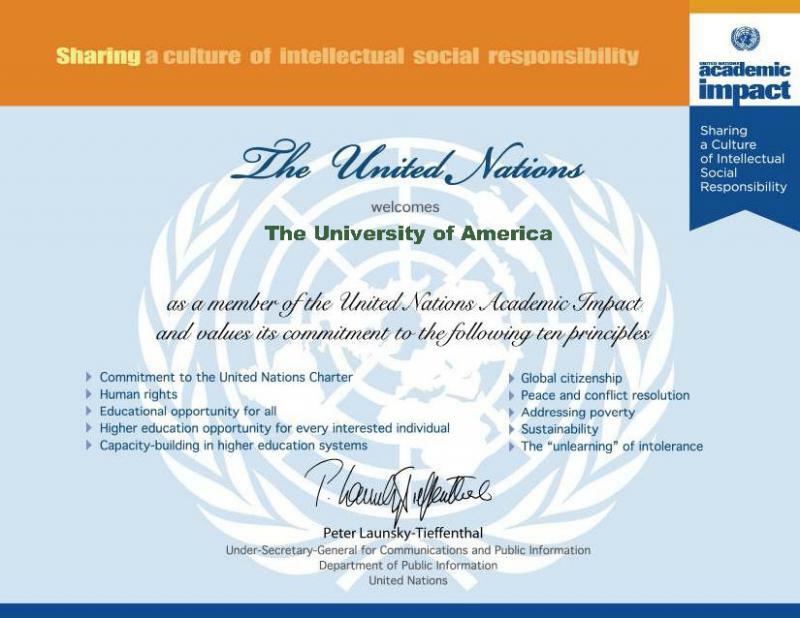 The University of America is a member of The Accreditation Agency Curacao (AAC). Copyright 2010 The University of America. All rights reserved.